The amazing thing was, each time she looked at them, Etta still saw something new- something she hadn't noticed before. In one devastating night, Etta Spencer loses everything she knows and loves. Thrust into an unfamiliar world by a stranger with a dangerous agenda, Etta is certain of only one thing: she has travelled not just miles but years from home. Nicholas Carter is content with his life at sea, free from the Ironwoods - a powerful family in the Colonies - and the servitude he's known at their hands. 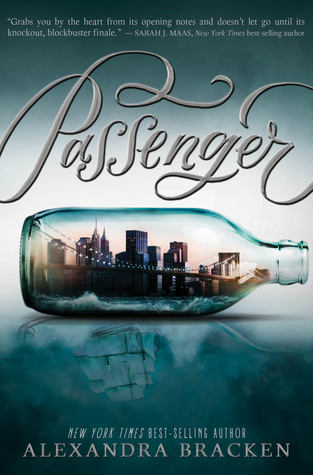 But with the arrival of an unusual passenger on his ship comes the insistent pull of the past that he can't escape and the family that won't let him go. Now the Ironwoods are searching for a stolen object of untold value, one they believe only Etta, his passenger, can find. Together, Etta and Nicholas embark on a perilous journey across centuries and continents, piecing together clues left behind by the traveller who will do anything to keep the object out of the Ironwoods' grasp. But as they get closer to their target, treacherous forces threaten to separate Etta not only from Nicholas but from her path home forever. I love the EPICNESS and GRANDNESS of this novel. I felt like I was swept away on this perilous journey alongside Etta and Nicholas as they search to find the astrolabe before into can get into the wrong hands. I think a few readers have struggled to get into it, but I honestly didn't have that problem. I was sucked in from the start and looking back, I can see how important those first few scenes are to the plot. This is a big book and needs to be approached with a huge chunk of available time to allow yourself to fully absorb the information provided. The book is very detailed and you feel like you are running with Etta and Nicholas. They speed through passages, jumping from one era to another, each one described to the fullest, that you feel like the author has already made the journey herself. I think my favourite era had to be London during the war, but you can tell each era has been fully researched. I loved watching the relationship grow between Etta and Nicholas. They had everything against them yet they couldn't stop the strong bonds that tied them. The ending was unexpected and heartbreaking for a while but it opened up the possibility to more adventures. I love a good time travel novel and this one most certainly didn't disappoint. In fact, I made it my Book of the Month for May. I can see why Disney Hyperion bought this, because it has all the makings of a blockbusting movie. If Cassandra Clare wrote time travel novels, this is the type of book she would write. Couldn't put it down! I didn't realize when I bought this that it was a series, slowly as my kindle was crawling from 98%-100% I realized there wasn't enough pages left to finish the story! Needless to say I'm now devastated- staring at the wall, I feel like I lost a friend.. I CAN'T WAIT for the next one!